If you are looking to add a nutritional boost to your meals consider cooking with Japanese seaweed. These sea vegetables are loaded with nutrients, minerals and flavor. They are rich in umami and will add oomph to salads, soups, broths, seafood and countless other preparations. So how do you cook with seaweed? Let's take a closer look at five different types of Japanese seaweed and how to use them in the kitchen. Perhaps the most familiar of all Japanese seaweeds thanks to its use in sushi and rolls. Nori is also sold as a snack and is a good source of vitamins A and C.
Try this recipe for salmon maki sushi. Full of umami and with great texture, kombu is a key ingredient in the Japanese broth known as dashi. It is highly nutritious and delicious in stews and salads. Another fun use for kombu? Use it to cook beans as it helps reduce the gas content in legumes. 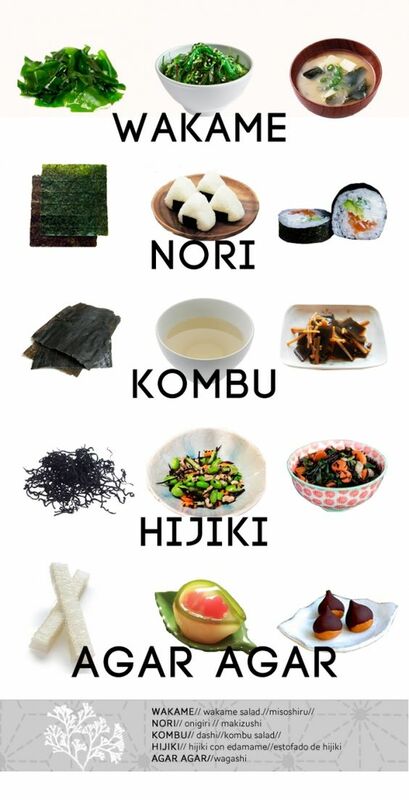 Try these 3 recipes with kombu. These small flakes of seaweed are an excellent addition to salads. They are black in color and rich in fiber, idodine, calcium, magnesium and iron. Hijiki is believed to aid the digestive system, lower cholesterol and boost energy. It should be soaked in water for 30 minutes before using in recipes. Agar agar is most commonly used as a thickening agent in desserts and is a great vegetarian alternative to gelatin. It's a popular ingredient in molecular gastronomy and is made from red algae. Discover the science of agar agar. A wonderful source of magnesium, wakame is low in calories and virtually fat free. It is commonly used in seaweed salad and soups, most famously miso soup.